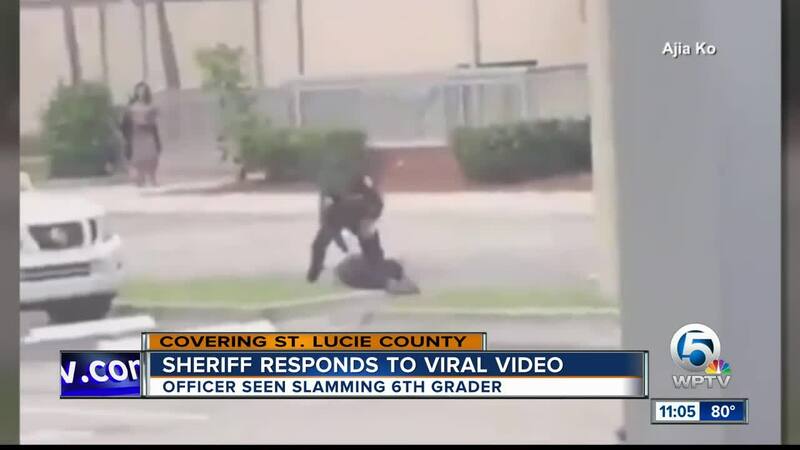 FORT PIERCE, Fla. — A viral video that is making the rounds on social media is drawing concern among parents. According to a newly incident report, a school resource deputy said the student, whose name has not been released, was being suspended from school and was "running around the school campus and not responding to any commands by the school staff" on April 9. The report said the student was being disruptive in a classroom and chest bumped another person. The student is currently in a Diversion Program and was arrested five days prior for aggravated assault, according to school staff. The incident report said the student was being disruptive in the Dean's office while waiting for his parents to pick him up, and eventually walked out of the office and ignored commands by school staff members. The deputy said the student ignored his commands and "continued walking with his fist clenched and had an agitated expression on his face. His brows were turned down and he was punching his fist into the palm of his hand." "That's kind of rough to be at a school campus, he didn't have to slam him down like that," said General Platt as he watched the video while picking up his twins on Wednesday. "I would have freaked out if I saw that in person," said Jazmine Arias as she was waiting to pick up her sister. 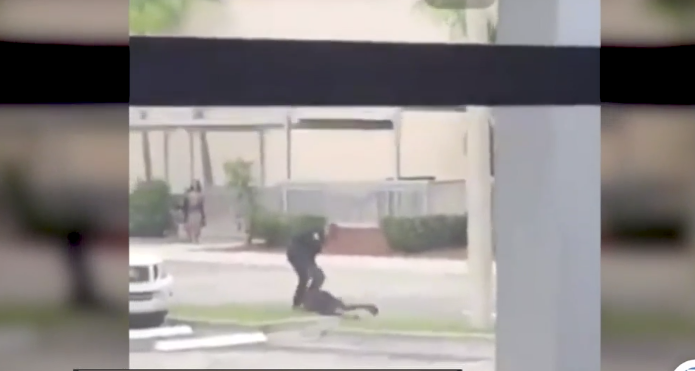 "He's a kid, I don't think a little kid should be thrown to the ground like that." The 15-second video shows a the school resource deputy run after a 6th grader outside the school Tuesday afternoon and slam him on the grass. Another video then shows the student in handcuffs walking away. "If the kid was fighting him back and he felt like he was in some kind of danger, then I could justify his actions, but it didn't appear to be that way," Platt said. At a news conference Wednesday afternoon, Sheriff Ken Mascara said the deputy did not use excessive force, and the video does not show what happened in the minutes beforehand. "Our school resource deputy is very familiar with this student and knows he has a violent history, including possessing weapons," Sheriff Mascara said. The Sheriff says the student was recently caught with a knife, and he's had to be escorted around campus by a staff member because he's been physically aggressive to staff and students. Sheriff Mascara says the 11-year-old was aggressive during dismissal on Tuesday, and when staff tried to stop him he ran away. 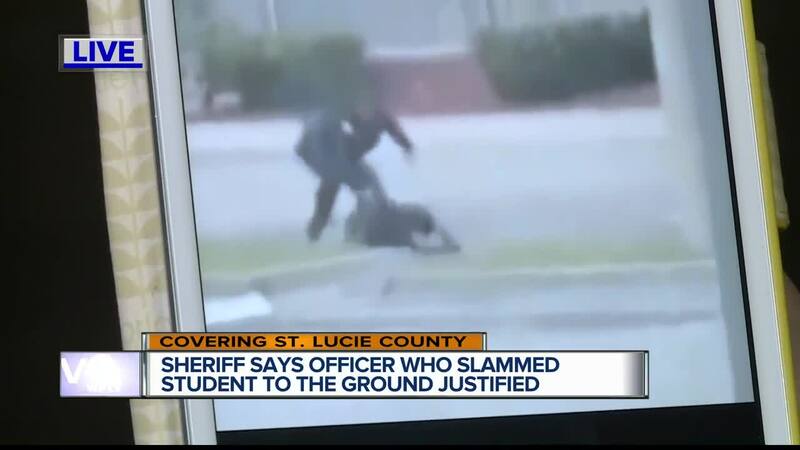 That's when the resource deputy took him to the ground. "At the end of the day the deputy did everything he could to diffuse the situation, and his use of force fell within the legal and our agency guidelines," Sheriff Mascara said. The deputy has been a school resource officer for eight years, three of which have been at Lincoln Park Academy. Mascara said the deputy has never had a complaint of excessive force. The student is now facing a number of charges, including assault and disorderly conduct. He was taken to the hospital briefly and left with a band-aid. His grandfather tells WPTV he is now undergoing a mental health evaluation in Lake Worth Beach.